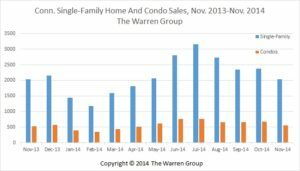 Boston, Jan. 13, 2015 – Single-family home sales in the Nutmeg State increased slightly in November, posting a gain of 0.4 percent, according to the latest report by The Warren Group, publisher of The Commercial Record. A total of 2,036 single-family homes sold in Connecticut during the month of November, a small increase from the 2,027 sold in November 2013. This marked the third consecutive month of sales increases. Year-to-date, sales were down by 0.5 percent with 23,598 sales, compared with 23,707 during the same period a year ago. The median price of a single-family home fell 1.6 percent to $238,100 in November, down from $242,000 a year earlier. November marked the ninth consecutive month that sales prices have decreased year-over-year. Year-to-date, the median price for homes sold was $252,000, falling 3.1 percent from $260,000 in the same timeframe last year. Condominium sales statewide posted a 6.3 percent increase in November, climbing to 558 condos sold, up from 525 during the same time a year ago. 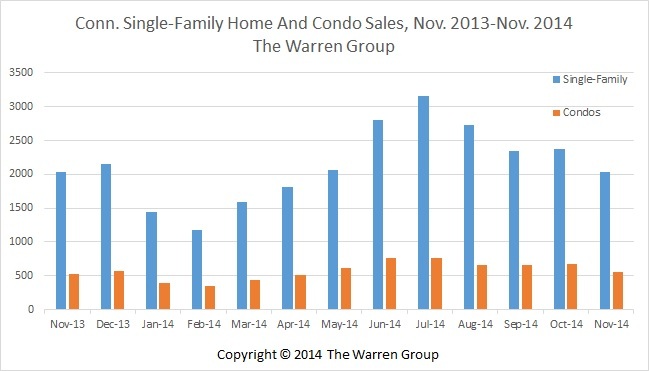 This marked the sixth month of condo sale increases year-over-year in 2014. Year-to-date, condo sales were up almost 3.3 percent, increasing to 6,381 from 6,180 during the same period last year. The median sales price for condos in November fell by 2.1 percent, decreasing to $165,500 from $169,000 in November 2013. The year-to-date median selling price was $169,900, down almost 1.0 percent from $171,500 a year ago.